CAN SOMETHING BE TOO EASY?? Check this out! The designer calls it ‘Easy Peasy Shrug’ and I think she’s being completely honest! This looks almost too easy to be true. 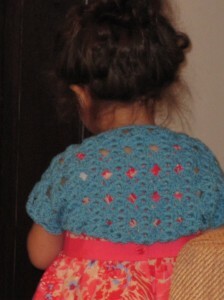 If you can crochet a rectangle – using any stitch I think – you can make a cute shrug like this one! The free pattern is available here complete with schematics! WOW, how neat. Love it. I was looking for something quick & easy. This fits the bill. THANK YOU.